The Governor, represented by Deputy Governor Mr David Arkley, Premier Paula Cox and Deputy Premier Derrick Burgess, and Leader of the Opposition Kim.Swan were all in attendance at this afternoon’s Catholic Mass for the late Dr Barbara Ball. 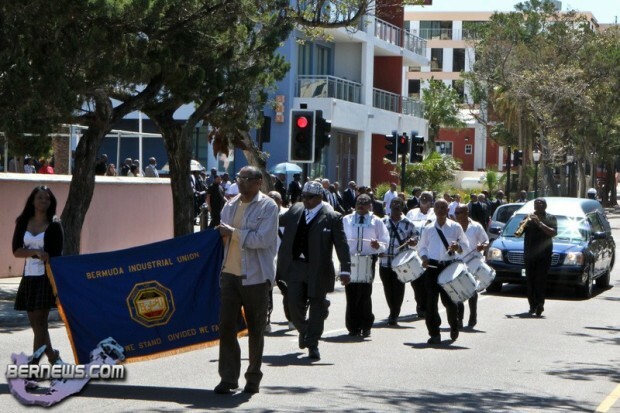 Others came from the Cabinet, the House of Assembly, Senate, and the Island’s other Trade Unions; and from many other walks of life in Bermuda. The celebration of the life of Dr Ball began with a march and procession from the BIU building on Union Street to St Theresa’s Roman Catholic cathedral on Cedar Avenue. The march was led by a small band. Her body was carried into the Cathedral by pallbearers from members of the General Council of the BIU. The day of the service coincided with the Catholic celebration of the feast day of St Joseph who is the patron saint for all workers. The service itself began with the traditional Lenten Catholic saying of the Rosary after which the service followed the form, with variations suited to an ecumenical congregation, for a normal Catholic mass for a deceased person. Deputy Premier and ex-BIU President, the Honourable Derrick Burgess read a tribute from the Premier. Mr Ottiwell Simmons, ex-BIU President, ex-MP, biographer of Dr Ball, late union associate of Dr Ball, and close friend of Dr Ball; read a personal tribute to Dr Ball. Towards the end of this tribute, Mr Simmons was partly overcome by emotion and struggled to finish. He was followed by Ms Yvette Saunders who read Dr Ball’s obituary. Sister Saunders too, was overcome by emotion, having to compose herself in order to finish. Lesson readers for the Service were Joan Hollis, a cousin of Dr Ball; and Tina Evans-Caines, God-daughter of Dr Ball. Ex-President Ottiwell Simmons and Ms Heather DeSilva were Gift Bearers. Hymns selected were Amazing Grace, Psalm 23 (Crimond), Here I Am Lord, and How Great Thou Art. Song leader Kerry Judd sang Ave Maria during the short period when Communion was being taken by those who came forward. Following the offering and taking of Communion, which, in the Catholic tradition was restricted to Catholics, the service ended with Dr Ball’s body being taken away for interment in St Paul’s (Anglican) Cemetery in Paget. Outside St Theresa’s, as her body was carried out to the waiting hearse, a lone horn player gave another soulful rendition of Amazing Grace. Pall Bearers to her final resting place were BIU Executive Board Members Arnold Smith, Glenn Simmons, Collin Simmons, George Scott, Graham Nesbitt, Cecil Durham, and Louis Somner. Dr Ball’s accomplishments spanned many genres. She was the first female doctor to practice medicine in Bermuda; the first Bermudian female black-belt judo expert; the first medical practitioner to be suspended from the publicly funded KEMH hospital; the first white person to hold an official post with the Bermuda Industrial Union; the first female to represent Bermuda’s workers before the United Nations; the first female official of the Bermuda Industrial Union to be elected to the House of Assembly and to date, the only female to appear before the Supreme Court on two occasions to answer charges relating to political and social activism. Gone from my sight – that is all. WE SHOULD BE HONOURED TO KNOW THAT SUCH A BEAUTIFUL HUMAN BEING WALKED AMONG US. Barbara’s family in the UK are saddened to learn of her death.We did contact her nursing home (2 yrs before her death) and would have wished to be informed and to pay our respects.We have happy memories of being tossed around by the judo black belt cousin.My mother Dr Kathleen Marianne (Pearson) Ball was her first cousin and sponsered her during her training in Liverpool.She stayed with our family on many occasions. Simmons,whom we believe has written her biography.